Saw and tried the helmet on at a local bike shop. The proper fit is a size larger than what I normally wear. I came home and searched online and found New Enough had it for $160 less with a promotion for a free HiDef (amber) sun visor. Ordered it Saturday evening, shipped Monday, arrived Wed, UPS ground. New Enough was out of the HiDef visor but shipped it free of charge the following week. Great customer service. Great prices. I will be shopping here again. I've been using the helmet for over 2 weeks with no issues. Very comfortable. 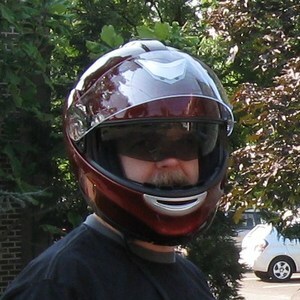 For a modular helmet the wind noise is minimal. Air flow is OK but I have a full windscreen on the bike. The sun visor comes down right to the top of my nose and the optics are very good no distortion. The smoke visor is dark enough that you dont need sunglasses on the brightest of days.